“The project started as a venture to find the Internet, but has slowly changed to the relationship between data and the landscape, and then again to the relationship between the self and nature.” Evan Roth. n50.204520e1.538171.fr follows on from Evan Roth’s solo exhibition Landscapes on Carroll / Fletcher Onscreen, 28 June – 28 July 2016. A physical counterpart to the work is included in the exhibition Looking at one thing and thinking of something else, Part one: Dialogues with Art History, Carroll / Fletcher Eastcastle Street, 11 November – 26 November 2016 (the online exhibition can be viewed here and details of the physical exhibition can be found here). The work forms part of Roth’s Landscapes series, which first featured in his solo exhibition, Voices over the Horizon, at Carroll / Fletcher’s Eastcastle Street space in Spring 2015. The series began as a pilgrimage to a remote area of Cornwall, on the south-western tip of the UK, where the trans-Atlantic fibre-optic cables that carry the Internet emerge from the ocean; a quest to rediscover the optimism, inspiration and sense of community he had found in the Internet’s early days. His pilgrimage has continued with journeys to Internet landing sites in Australia, France, New Zealand and Sweden – n50.204520e1.538171.fr was filmed at Saint-Valery-sur-Somme along the North coast of France. “The longer I work on this new series, the more peripheral the Internet becomes in my thinking. I’ve been using the phrase “Internet landscapes” to informally describe the work, but lately I’ve been dropping the “Internet” and just calling them “landscapes” (which I think is more true to what they are). Even though the Internet is a strong character in the narrative, the work is really more about the questioning of my surroundings and search for solutions to issues that fundamentally challenge my art practice and worldview.” Evan Roth in The Black Chamber – surveillance, paranoia, invisibility & the internet, interview with Domenico Quaranta, Bani Brusadin and Ruth McCollough. Although the work begins with a journey by the artist to the landfall site of an undersea Internet cable and a single, continuous static shot film of the landscape (for n50.204520e1.538171.fr, Roth visited Saint-Valery-sur-Somme and shot an 18 minute film), the work itself consists of a digital file of the film located on a web server situated near the landfall site, displayed on a website with a URL web address made up of the GPS co-ordinates of where the camera filmed the landscape, and of the server hosting the video – for n50.204520e1.538171.fr, n50.204520e1.538171 are the GPS co-ordinates and .fr locates the server in France – and, for Roth, the work is only completed when the website is viewed by an audience, i.e. when an infra-red signal travels along the cables from the server hosting the digital file of the film, to the viewer’s computer which displays the film in their browser – the work is the film, plus the network, plus the viewer. “Visiting the Internet physically is an attempt to repair a relationship that has changed dramatically as the Internet becomes more centralized, monetized and a mechanism for global government spying. Through understanding and experiencing the Internet’s physicality, one comes to understand the network not as a mythical cloud, but as a human made and controlled system of wires and computers.” Evan Roth in Domenico Quaranta, Internet Landscapes. A Journey in Space and Time, in Evan Roth, Kites & Websites, 2016. Roth films the landscape using infra-red light, a reference to the infra-red light that transmits the signal along the Internet’s fibre-optic cables and to surveillance cameras. The images are accompanied by a two-channel audio track; one channel being the ambient sounds of nature and the other from custom-designed hardware that scans radio frequencies in sync with the artist’s heartbeat. Both the camera and audio-recorder are based on equipment used in ghost hunting. “I would also point out that there are things happening within the frame. On first glance it seems as if nothing is going on, but you should be able to notice subtle changes in light as clouds pass in front of the sun, animals, people, airplanes and boats moving in and out of frame, and changes in the wind and wave patterns. These aren’t ‘actions’ as we are used to actions in a typical Internet experience, but actions in nature. I also think there is a performance aspect in watching the piece from start to finish. All of the things that might happen during that period (email notifications, SMS messages, incoming tweets, your impulse to move the mouse so you can see how much time is left) are all a part of the viewing experience. These clips, which are typically shorter than the length of a TED talk, can seem like an eternity to watch in their entirety (especially when viewed in the privacy of your own browser).” Evan Roth, in Domenico Quaranta, Internet Landscape A Journey in Space and Time, in Evan Roth, Kites & Websites, 2016. If the viewer pastes the co-ordinates n50.204520e1.538171 into the search bar of Google Maps, an alternative exploration of the location is possible. The route taken by the infra-red signal from the viewer’s computer to the web server can be followed using the computer’s terminal window: with the website open on the screen, go to the computer’s terminal window – /Applications/Utilities/Terminal on Macs or /Programs/Accessories/Command Prompt on PCs – paste the following line and hit return: traceroute n50.204520e1.538171.fr (for Macs) or tracert n50.204520e1.538171.fr (for PCs). Alternatively, James Bridle’s Citizen Ex – http://citizen-ex.com/ – can be used. Another dimension of the work can be experienced through the source code: in the Chrome menu bar, go to: View/Developer/View Source; Firefox menu bar: Tools/Web Developer/Page Source; Safari menu bar: Safari/Preferences/Advanced, check show Develop Menu in menu bar Develop/Show Page Source (more details can be found here). Here the video can be viewed to the size of the screen, framed by a black border (it is best viewed full screen without the bookmarks bar or toolbar) and, if mounted on a wall, it becomes reminiscent of a traditional landscape painting. Each landscape in the series is a unique work. On purchasing the work the collector receives a monitor, a networked media player, cables, ownership of the lease to the URL and digital files of the video. The purchase is covered by a sales contract (viewable here). Evan Roth is an American artist based in Paris whose practice visualises and archives culture through unintended uses of technologies. Creating prints, sculptures, videos and websites, his work explores the relationship between misuse and empowerment and the effect that philosophies from hacker communities can have when applied to digital and non-digital systems. His work is in the public collections of the Museum of Modern Art, New York, and the Israel Museum. Recent exhibitions include the 2016 Biennale of Sydney; Electronic Superhighway (2016-1966) at Whitechapel Gallery, London; and This Is for Everyone at the Museum of Modern Art, New York. Roth co-founded the arts organisations Graffiti Research Lab and the Free Art and Technology Lab and in 2016 was a recipient of Creative Capital funding. The Black Chamber – surveillance, paranoia, invisibility & the internet, interview with Domenico Quaranta, Bani Brusadin and Ruth McCollough (full exhibition catalogue here). 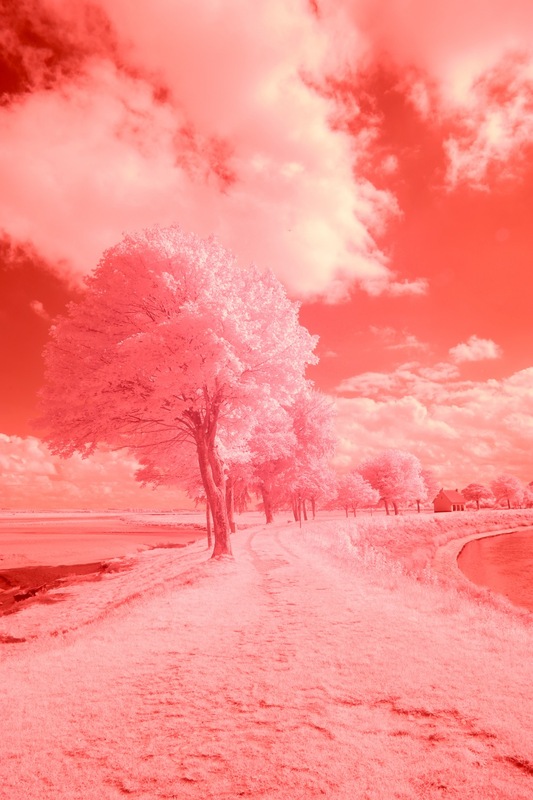 Infra-red Wuthering Heights, interview with Filippo Lorenzin in Digicult magazine. “The filming requires me to be still in these locations for periods of 10 to­ 20 minutes at a time, and what I found during these moments of stillness was that I really wanted to check my inbox. After 30 seconds I would instinctively reach for my pocket to see what was happening on email/twitter/instagram. I remember one time I was filming on top of a cliff in Sweden looking out over the water and whales started coming up for air. It was so quiet that the sounds of their breaths were strikingly loud. Despite this being one of the most beautiful moments I’ve had in nature, I was disappointed in myself as I went from witnessing this sublime moment, to feeling slightly bored, and then finally questioning whether I should post it on Instagram, all within the course of two minutes… Part of what interests me in the Internet Landscape series is the struggle to take more control over my relationship with time and how it is connected to the consumption of media, nature and the moments when I am not being social (online or in person).” Evan Roth, Infra-red Wuthering Heights, interview with Filippo Lorenzin, Digicult magazine.